Hike, snow shoe, cross country or snow mobile right in the back yard of this GREAT cabin that connects to miles of US forest service land. 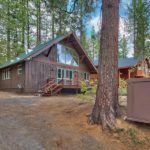 This sweet Chalet has many upgraded features including on demand water heater, remodeled bath, new stove, washer/dryer and roof is less than 5 years old. One bedroom on main floor and 2 areas for additional bedrooms at large loft. The wood burning circular fireplace creates a warm and cozy atmosphere. Come see this Great cabin today! This entry was posted on Saturday, January 13th, 2018 at 6:49 am and is filed under Rover IDX Property, Sold Property. You can follow any responses to this entry through the RSS 2.0 feed. Responses are currently closed, but you can trackback from your own site.